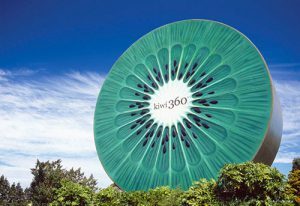 With over 250km of coast and some of the country’s best sandy beaches, sunny Bay of Plenty is also New Zealand’s kiwifruit capital and has the largest port in the country. 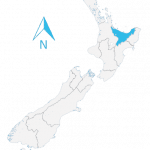 A long basin stretching along Northern Pacific coast of the North Island, bordering the Waikato, Hawke’s Bay, and Gisborne, the Bay of Plenty is a fast-growing region, primarily due to its location by the sea. The Port of Tauranga is New Zealand’s largest commercial port, through which large consignments of timber are exported daily. Fertile soils means agriculture, mainly fresh produce, is strong. The name “Bay of Plenty” originated with the English explorer James Cook during his 1769–70 exploration of the country. Cook noted the region’s abundant resources and Europeans began settling around as early as the 1830s. Tauranga, the largest city, has a population of around 115,000, while Rotorua (inland) and Whakatāne (coast), are respectively home to 65,000 and 33,000 souls. Tauranga, its sister city Mount Manganui, and Whakatāne encompass the ideal sea-side living. Rotorua city borders the southern shores of the lake of the same name. 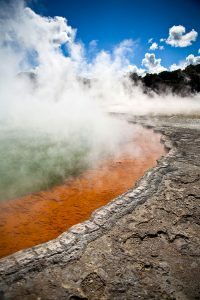 A strong Maōri heritage and the region’s important geothermal activity contribute to making Rotorua a major tourist destination in the country. Bay of Plenty has a temperate, almost mediterranean climate, with temperatures hovering around 10-12C in winter and reaching above 28C in summer. 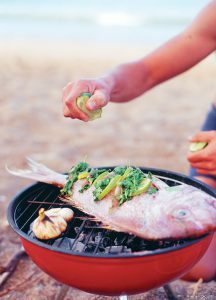 One of the country’s sunniest places, the region is favoured by locals, a lot of them retirees, for its relaxed lifestyle opportunities. The majority of migrants to this region is from the UK and Ireland. The Port of Tauranga is obviously the region’s main hub of activity. Kiwifruit are the main horticultural export, with avocados growing more and more important over the last few years. Forestry is a major employer, and the region is home to the world’s largest hand planted forest. Engineering and construction, predominantly in the boating industry, are also large players. Last but not least, the region’s sunny climate make it a popular destination and tourism spot, with ocean-based activities being very popular with locals and overseas visitors alike (whale-watching, water sports, diving, etc.). In and around Rotorua, tourism is by far the most important source of revenue, boosted by both Māori traditions and geothermal activity.